At the middle of the base is the “Wheel of Dharma”, to its left a galloping horse and to its right, a bull. The inverted lotus found on the Ashoka Pillar is omitted in this emblem. The inscription at the base, in Devanagiri script says “Satyameva Jayate” (from the Mundaka Upanishad) and means “Truth Alone Triumphs”. 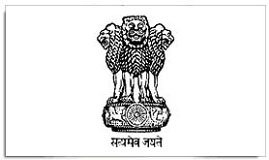 This emblem was adopted by the Government of Independent India on the “Republic Day” on the 26th of January 1950.